Once the source of a small river that ran through these badlands, these caves are still home to the river, but it remains underground now instead of working through the nooks and crannies of the slate fields. Broken up into multiple elevations throughout, these caves have been home to beasts and men alike seeking water and refuge from the badlands. Now they are home to Mohkath, a reclusive mantisfolk necromancer. He uses the space to study and is attended to (and defended by) a very strange assortment of animated giant beetles and skeletal constructs. Some locals are happy to have a potent wizard nearby, even if it is a creepy one. They bring Mohkath offerings of food and skeletal remains in order to try to curry his favour in case they ever need his intervention in local affairs. But most are wary of a necromancer living nearby – and more than a few would sleep much better at night should someone take care of the whole “bug necromancer” issue. 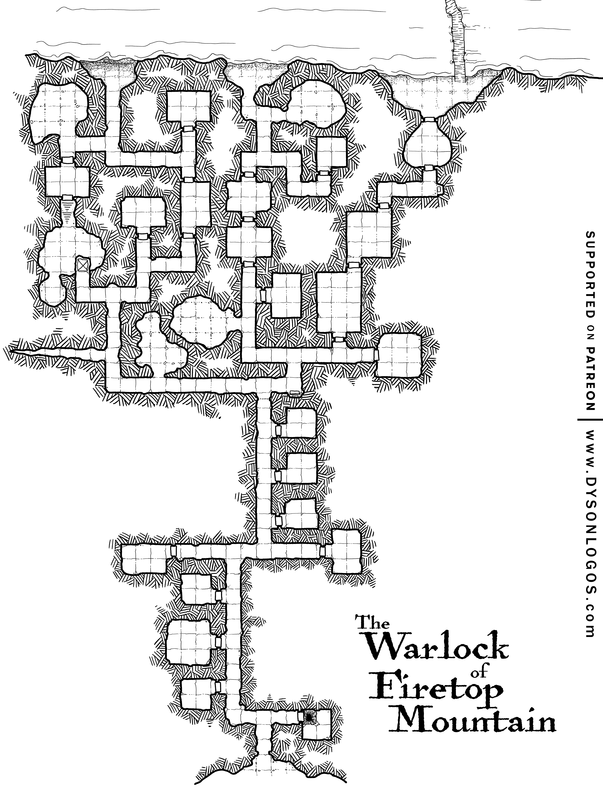 It is thus a great relief to stumble into the final caves, only to discover that before you even face the Warlock in order to get to his treasure, you must deal with a fierce dragon that lairs in the cavern. 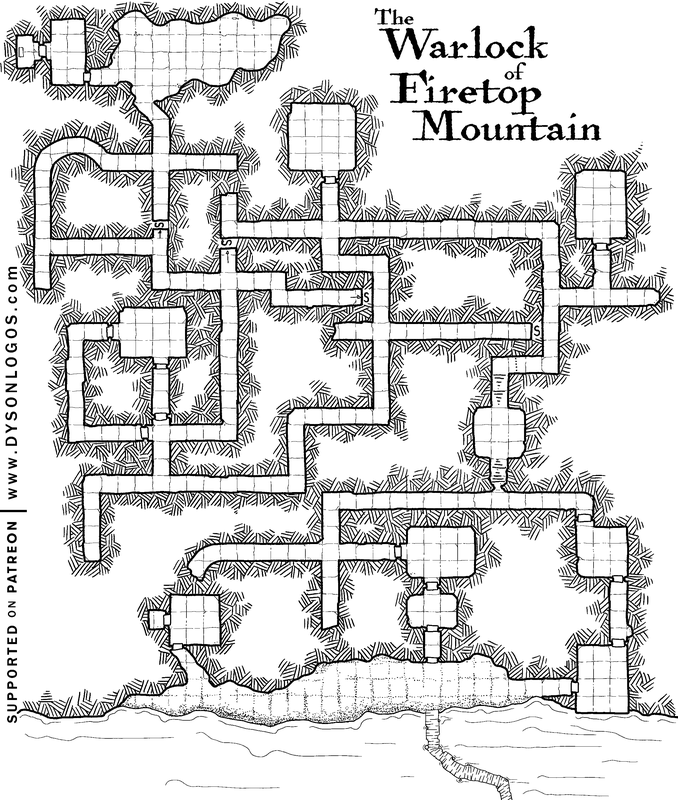 Through dozens of playings of the Warlock of Firetop Mountain, I only got through the maze a few times before giving up (often because I was playing it at school during a break). You could navigate the rest of the book without a map, but if you failed to map this section, you were effectively wandering blind – doubly so if you made the mistake of triggering one of the teleportation traps. So last month I finally sat down and navigated every bend, dead-end, secret door, nook, and cranny of the maze. In my head the maze was small – maybe 1/4 the size it appears here. But getting the corridors to fit together well ended up stretching them out significantly until the north side map was nearly as big as the (much more densely populated) south side. One of the first things noticeable about the Athenaeum when approching it from the broken bridge on the main level is the upper galleries and open staircase leading there. Above the main entrance is a long gallery along the wall of the underground crevasse with five windows looking down over the bridge. At one end of this gallery is a twisting staircase that leads between the levels, fully exposed and open to the crevasse for a portion of the climb. At the other end is a larger gallery and lookout. It was the way of the Etturan Dynasty to show the might and connection to the earth of the rulers to dig out underground complexes to serve as tombs. 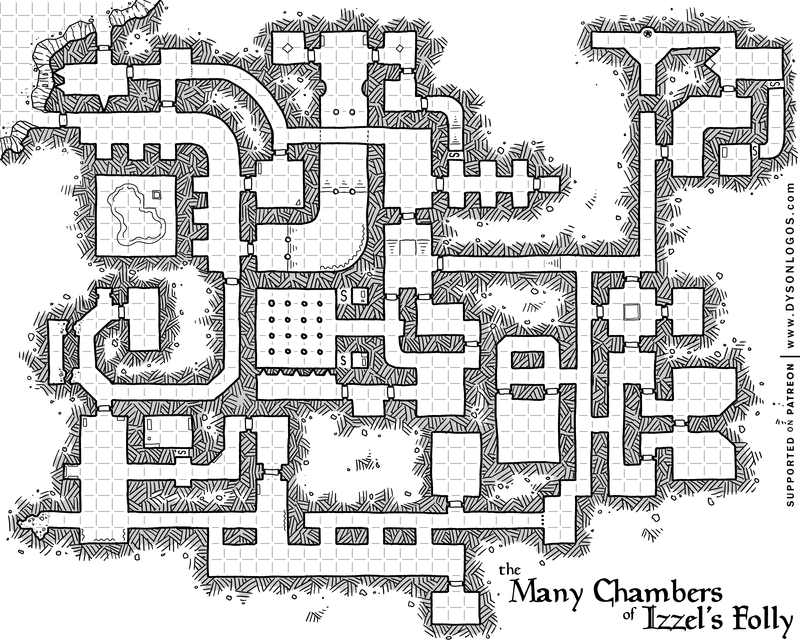 Some tombs were fairly simple affairs, dug down as far as they could manage before the ruler’s death. Others were more massive undertakings – complexes of tombs, crypts, temples and shrines dug into the native stone of the land. 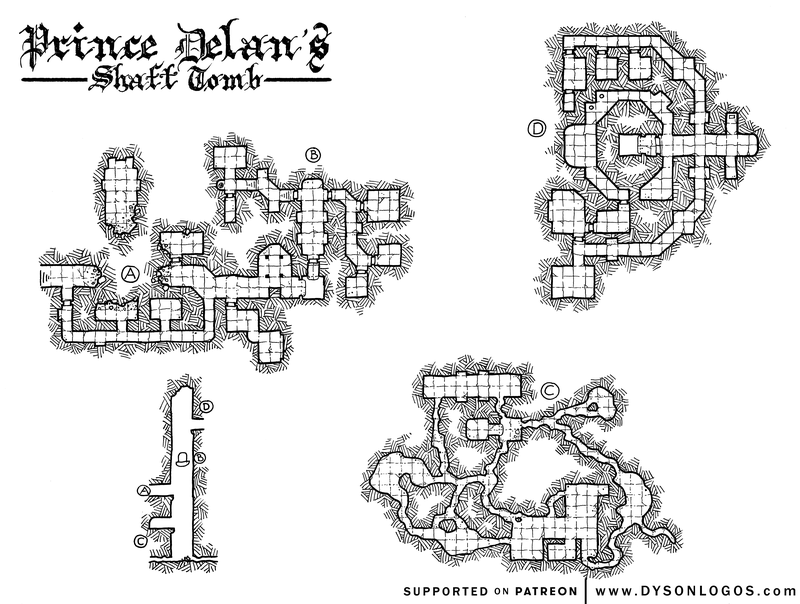 Prince Delan’s Tomb is one of the Etturan Dynasty’s “lost tombs” – roughly 40 tombs who’s locations were lost with the burning of the Tarek Archives. The tomb itself is a style that was made popular by a much earlier Etturan King, with various structures built off a central shaft. During construction wooden scaffolding was assembled in the shaft in order to climb from one level to another. Once Prince Delan was entombed the wooden structure was burned away leaving the central shaft with no easy means of accessing the other portions of the complex. 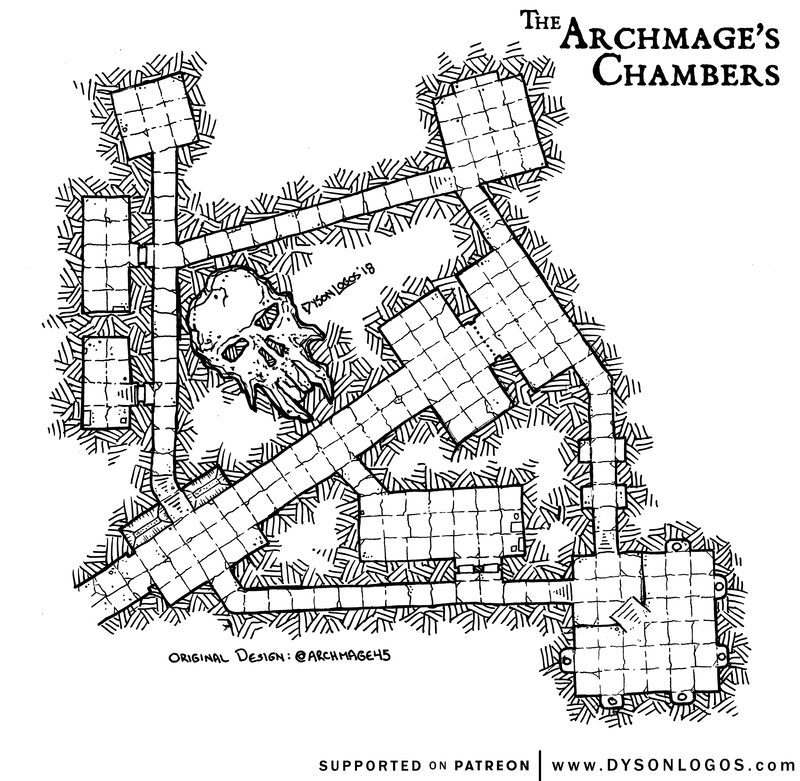 Much to the chagrin of anyone exploring the site now, sections of the tombs have collapsed, and foul beasts have moved into the bottom of the shaft and live in the walls down there making anything that dangles down to the bottom a danger. The Iron Obelisk weeps in near silence – the pools of ichor growing around it, fed by its melancholy nature. The ichors seep down and flow where underground waters should, tainting the darkness with the ennui and melancholy of the pillar of iron. Slow grinding noises are heard nearby, as if the world is changing itself – pulling away as far is it can from the source of this ichor. The wound where the Iron Obelisk sits has grown forming a cave nearly 200 feet across where the world tries to isolate the rusted spike within it. The Iron Obelisk has many powerful uses. Flakes of rust taken from the area around it and ground to dust make sleep spells incredibly more potent, whereas rust taken from the Obelisk itself can be used to counter most forms of mind control and charms. Bits of iron taken along with this rust can be worked into somber weapons and armour that spread their melancholic nature to their bearers, but also to their foes. But those who touch the iron obelisk itself or the black ichor are cursed with the yearning sadness of the device. They will seek out places underground where the ichor can be found, and while the ichor does nothing to sate or alleviate the sadness, it calls to the cursed and bathing in it will indeed remove any other curses or diseases the target is afflicted with. 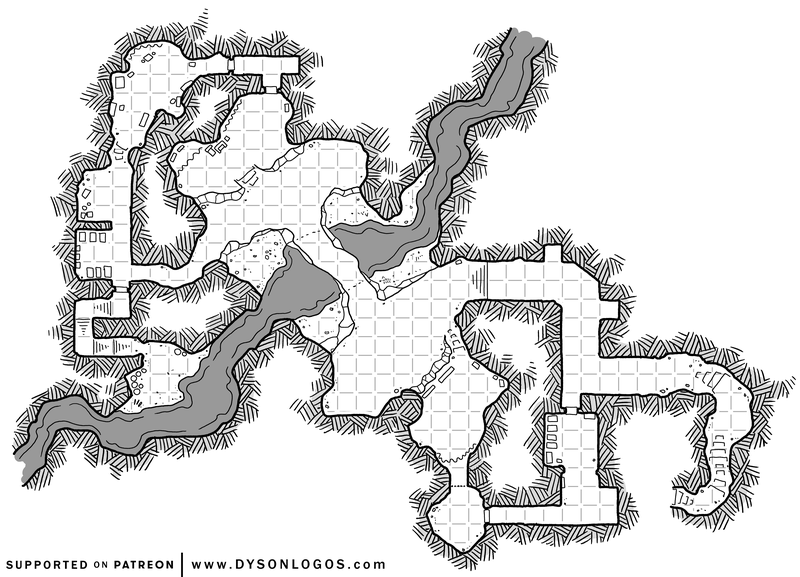 In fact, when adventuring underground, those cursed by the obelisk or the ichor will often find themselves in proximity with the ichor – even if it shouldn’t be there. 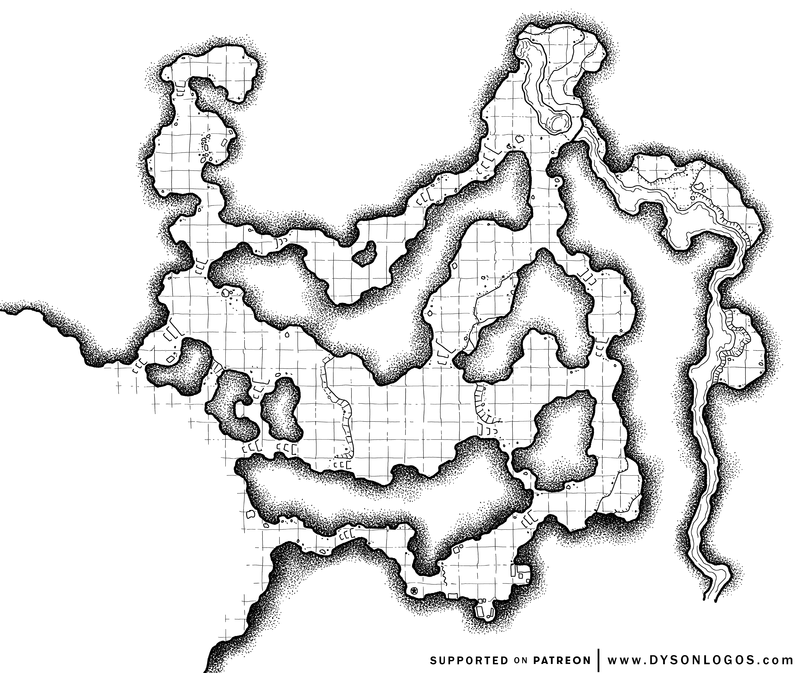 There is a 25% chance that any adventure leading them underground will lead them to the black ichor in some way. 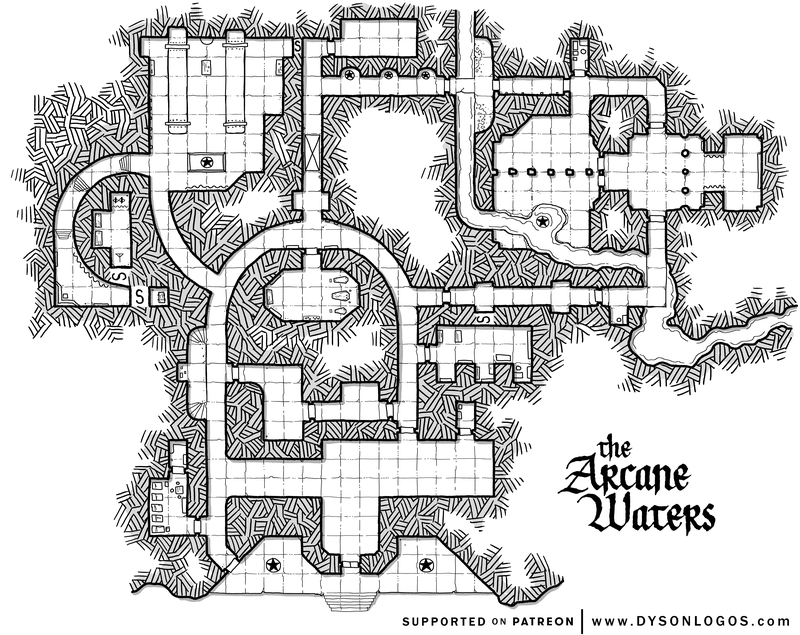 It will replace water in dungeons and adventures, and will seem ominously ever-present until the curse is broken. Our second Fifth Edition adventure is now out at RPGnow! 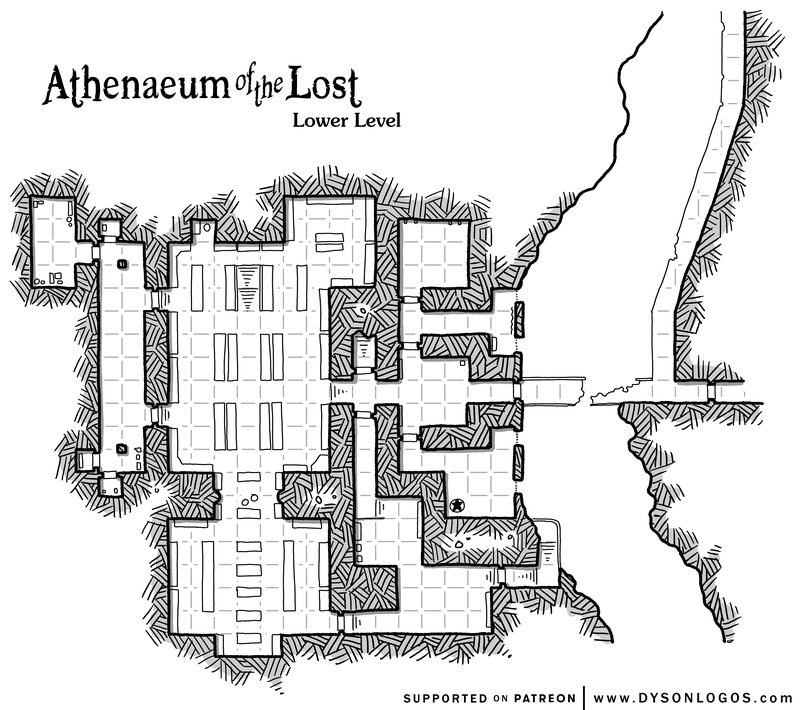 A Fifth Edition adventure for first and second level characters. Brutish orcs guarding a vast underground treasure. If that doesn’t sound like a first-time fantasy adventure, I don’t know what does. Orcs in Tarodun’s Tomb is an adventure for first time players looking for a quintessential first-time D&D experience: orcs fill the role of the classic fantasy monster, and it takes place in a dungeon filled with challenges, traps, and puzzles that can be solved in a number of ways. The adventure can be finished in a single session, and provides a solid start to a new campaign. This Fifth Edition adventure is written by Kiel Chenier (ENnie award winner for Blood in the Chocolate), and mapped by Dyson Logos (Waterdeep – Dragon Heist, Circle of Hands, Dyson’s Delves, this website you are looking at, etc). It will work to launch a 5th edition fantasy campaign in just about any setting. So head on over to RPGnow, grab yourself a copy, and find out exactly what those orcs are up to! While much of the city is served by “surface sewers” to move waste and water, in parts of the old town there exist proper underground sewers that date back to the previous empire’s attempts to clean up the city as a whole. Basements in these neighbourhoods occasionally incorporate parts of the sewer construction, or vice versa. And of course, in the trope of D&D sewers, they have become home to wererats and other foul creatures that represent the decay and seedy side of civilization. This map focuses on one of the more interesting parts of the sewers under Delren Street. 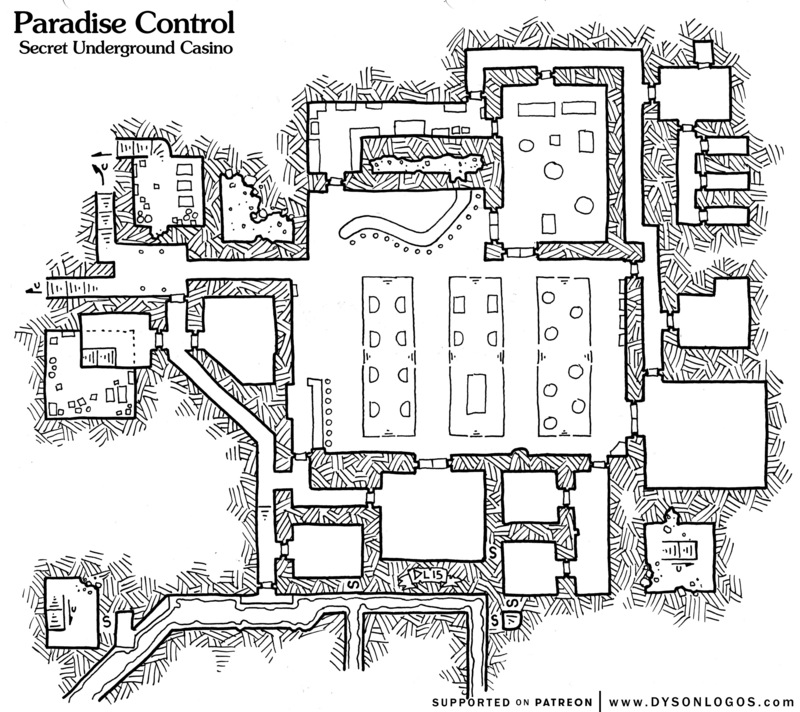 The central location (top centre of the map) is an old basement that is no longer connected to the structure above it and that is linked into the sewers by a secret door. This basement is currently in use by Skittler, an old wererat sorcerer who maintains a small study and bedroom in a side chamber. The rest of the basement is kept fairly clean, with Skittler sweeping it out regularly (and leaving a small pile of dust right outside the secret door). South of Skittler’s lair is the lair of a couple of less “human” wererats. The entrance to this lair are a pair of large rat-holes in the walls of the sewer – however recently they’ve taken to bringing in larger items to make themselves more comfortable, and have had to enlarge one of their holes to do so – meaning that it is only a matter of time before someone discovers this hiding place. To the right we have a maintenance access to the sewers (a hatch leading down stairs to the sewers themselves. Extended sections of this area have been barred off with a permanent portculis-type wall. 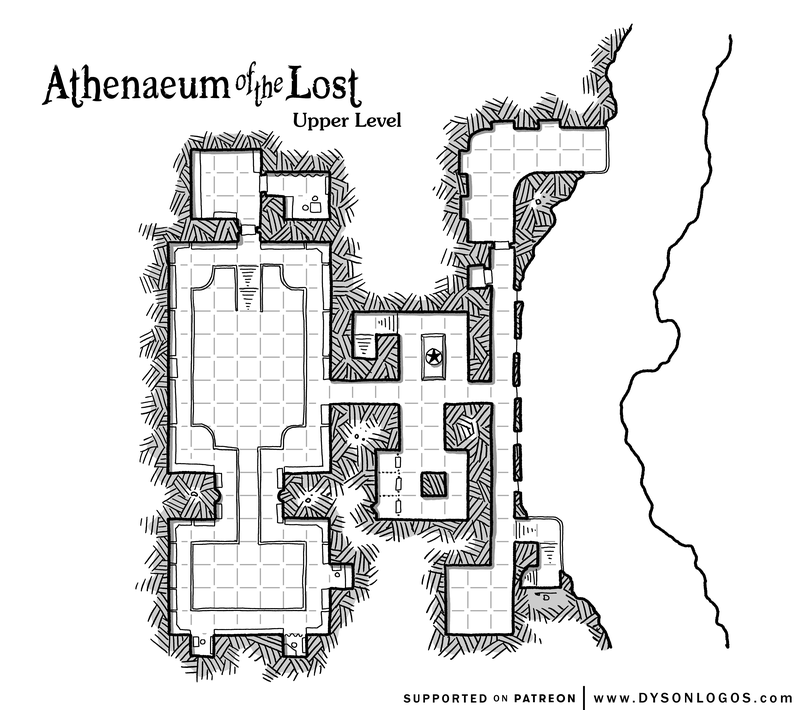 At the upper-right edge of the map we have a section of these structures that has been sealed off from the sewers proper and converted into the basement of a small inn above.